Tomorrow signifies my first day back at my old J O B. Yes, my teaching duties are over until August and I am back to being a full time stay at home Momma! It always seems like a tense transition. This transition will be more difficult then the past because I had the privilege of having my husband home for the past six weeks! We are foster parents and his job allows him up to six weeks fmla to help when we have a new child in our home. It was a HUGE blessing to us ALL! I can’t brag enough on him for what all he did for our family. I was working three days a week but was involved with things that kept me out of the house for technically four days out of the five. He cooked, baked, folded clothes, washed the dishes, straightened the house, took kids to the all the intake appointments, completed honey dos, and even grocery shopped! Seriously, he was a ROCK STAR and tonight I am sad because I am going to miss him being here helping me out so much! 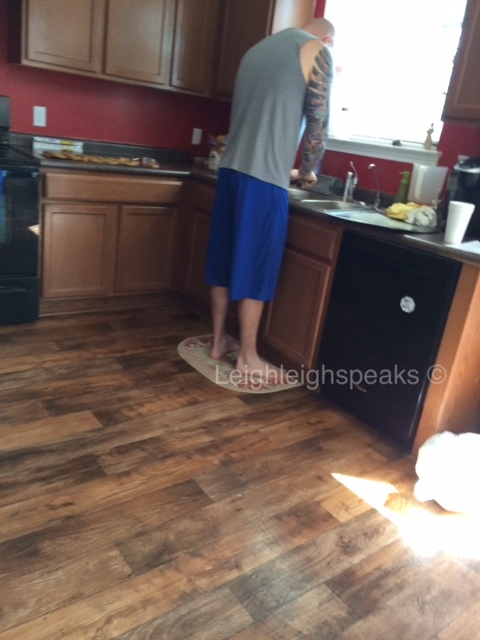 MY MAN BAKES AND WASHES DISHES!! This week I will concentrate on getting the house cleaned, laundry caught up, a meal plan made, groceries bought, all while juggling a doctors appointment for my daughter and involvement in the activities the last week of school brings! I am excited that I do at least have a few more days to accomplish most of this while my older children are still in school. I am promising myself that I will not stress on the mess summer brings with the littles home. This will be a peaceful transition as I find my SAHM groove back. This summer I don’t want to concentrate on completing all the lists of things that need to be completed upon the Pinterest SAHM standards, no I want this to be a summer that my kids remember how much fun there Momma was. We will play, we will swim, we will bake, we will go out for play dates, we will makes messes, we will be lazy on some days, we will have fun, all while I am teaching them still to become responsible clean young people. Saying goodbye to the pressures of being the PERFECT stay at home mom makes you beautiful and free to get what your family needs accomplished first. These needs will change with the seasons of your life. My babies are not going to be little forever and I acknowledge this sad, sad truth. How are you feeling with summer break days away? How will you transition into having the babies home for summer? I am in panic mode because my youngest baby has only one more year before she starts Kindergarten! Our oldest is going to be a sophomore in High School next year! I have been guilty of worrying more about getting things accomplished rather then focusing my attention on them. Thank you Sasha!